For four months, in 1980, the serial killer known as “The .22 Caliber Killer” terrorized Western New York with what appeared to be a racially-motivated killing spree. The killer turned out to be 25-year-old Joseph Christopher, who was caught and tried 4 months after his first killing. In all, he killed 12 people, some by rifle and some with a knife. In 2 of the killings, he cut out the heart of his victims with a knife. 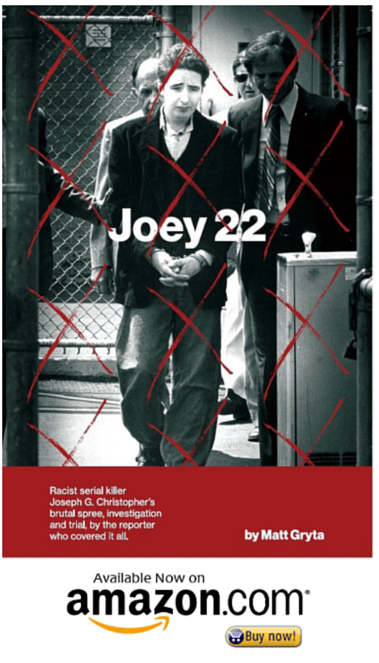 “Joey 22” is written by Matt Gryta, the Buffalo News reporter who covered the crime spree, the apprehension of Christopher, and the lengthy legal process that followed. Because Gryta was there throughout the process, he is able to give a unique perspective on the crime and its effects on Western New York. He not only presents the facts of the case, but presents them in the context of the time, when racial tensions were high throughout the United States, and the killing spree was seen as a symptom of the larger racial issues plaguing the country. True to his roots as a reporter, Gryta has written a detailed, fact-based account that never crosses the line into melodrama or wild speculation. The facts of this case have enough drama on their own and do not need embellishment to be fascinating, and the author presents them in such a way that this true story reads like a top notch fictional thriller. One of the most fascinating aspects of this book is the inclusion of the psychiatric report that was completed as part of Christopher’s defense. It is the killer’s own account of the spree, from his point of view, and gives another perspective both on the crimes and on the killer’s psyche. This is a mesmerizing account of a crime and of a killer that takes the sometimes confusing twists and turns in the case and makes them both understandable and absorbing to read. In the end, the crime spree of Joseph Christopher is hard to fathom and probably impossible to fully understand. But “Joey 22” does an excellent job of giving the reader a window into the crimes, the killer, and the time and place in which the killings took place. Highly recommended for anyone interested in true crime, history, criminology and for lovers of crime thrillers. Matt Gryta is a veteran crime reporter based in Buffalo, New York. A staff reporter for the Buffalo News for nearly four decades, Gryta has spent his entire career covering gritty stories of crime, punishment and violence in the state of New York. Early in his career, Gryta served as a U.S. Army war correspondent during the Vietnam War. More recently, he has appeared on E! Entertainment Television and Investigation Discovery to shed light on remarkable cases he has covered.